Hertsmere Borough is covered by Ordnance Survey (OS) Landranger map 166 (1:50,000 scale) and by OS Explorer maps 173 and 182 (1:25,000 scale). Long Distance Paths are only shown on OS maps once they are waymarked, so The Hertsmere Way will not be shown for a while yet! Walkers can report any public right of way, other path or highway problems which they encounter along the Way or its support routes to the Way's creator by e-mail (see the Contact page). Walkers can alternatively (or additionally) report public right of way or highway problems to Hertfordshire County Council's Rights of Way Service or to its Highways Department as appropriate (see the Links below), and fly-tipping problems to Hertsmere Borough Council (see the Links below). Walkers can also report public right of way problems to The Ramblers Central Office through a form on its website (see the Links below). Remember to include full details of the location, the date and the problem(s), with photos if possible. 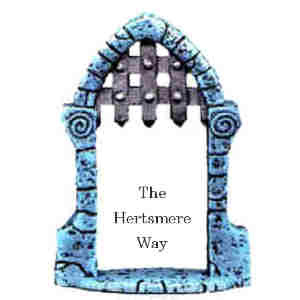 If you would like to know more about the creator of The Hertsmere Way, go to the Info page on www.thehardys.org. Walkers are responsible for their own legal and responsible conduct, and their own safety and risk management, including following the Countryside Code and the Highway Code. The Hertsmere Way's creator cannot accept any liability for walkers following Way routes. Only the names and places/areas of posters of news/views and photos and of Walker List entries will be included on the site. The basic personal data provided by anybody who contacts the Way creator by e-mail for the purposes of identification and e-mail responses will be kept in absolute confidentiality and will not be provided to any other party without the specific agreement of the provider. It is hoped this site is accessible and easy to use. Please e-mail (see the Contact page) if you have any concerns about privacy and accessibility on the site.